VIAVI Solutions has launched the industry’s smallest handheld network tester. The new T-BERD/MTS 5882 tester has a number of critical features to help in fiber characterization, multi-protocol service activation, troubleshooting, and maintenance for next-generation mobile and cable networks. Emerging network architectures require precise timing to synchronize distributed equipment, such as with the IEEE 1588v2 Precision Timing Protocol. This applies to mobile networks with distributed 5G radios interoperating with LTE macro cells, in cable networks where distributed Remote PHY devices (RPD) require synchronization for proper DOCSIS functionality, and in utility networks for the synchronization of distributed power transmission equipment. In all cases, ensuring that equipment is properly synchronized is critical for high-quality network operation, yet this is becoming more difficult to achieve due to growing complexity and convergence. In order to help service providers and their contractors simplify testing of these complex technologies, the T-BERD/MTS 5882 portable solution covers a broad range of tests in an automated workflow. This lightweight, versatile tool significantly reduces time in the field for technicians of all skill levels across hybrid workforces. The move to 5G, Remote PHY and other distributed technologies means even more stringent synchronization targets must be met to prevent service degradation. 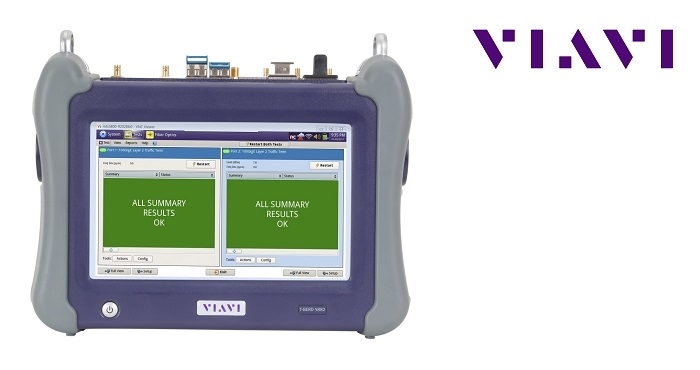 Based on VIAVI's leadership in fiber and communications network testing, and the company's collaboration with Tier-1 service providers, the T-BERD/MTS 5882 solution addresses these critical requirements. This instrument is optimized for fiber characterization, multi-protocol service activation, troubleshooting and maintenance across mobile, cable and power utility networks. Job Manager application that consolidates and automates testing and reporting, resulting in industry-leading job accuracy and timely completion in around 30 minutes.